In what was first blown off as an attempt at an April Fools Joke, this story seems to be legit. I even saw people posting this at this forum saying it was a joke, however the story does check out. 3Ders released some pretty amazing photos of these 3D printed concrete homes. The homes were printed by a Chinese company called Winsun, using a 490 feet long, 33 feet wide, and 20 feet deep, 3D Printer. A majority of the concrete material used by the printer is derived from concrete waste and glass waste after tearing down other buildings and structures. 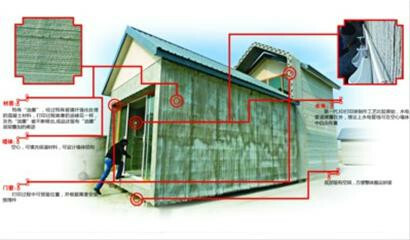 The homes were not printed in the location they will eventually reside, but instead printed in the Winsun Engineering and Design factory and will be transported to a final location. The homes will cost as little as $4800, and provide housing for some of the poorest residents in the country. These 3d printed homes will not be tiny. Some will be as large as 2100 square feet in size. These structures still require metal roofing, windows, and a few other elements to make them structurally sound, however the main frames of these homes are printed with a very strong material. That is super awesome, I saw a TED Talk a while back about a guy wanting to print full houses, plumbing, wiring, everything. It was a mix of an extruder and an arm that grabbed materials from designated spots outside the construction zone and printed them (put them) in place. This doesn't surprise me at all. Concrete, I would think would be one of the easier materials to print with on a large scale. These large 3D Printers will be popular in the future, no doubt about it. It's just that they need to find an easy way to fold them up, and transport them. If they can use multiple materials, that would be very helpful as well. These homes are amazing. Although they are not printed in one piece, they are printed in several pieces and then moved to the construction site. Either way this is huge for building cheap homes from recycled materials. 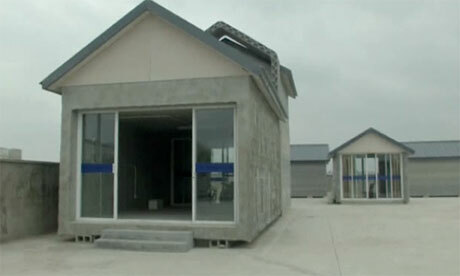 Here are some more images that News.cn has just put up showing the construction process of these 3d printed homes. I see that physical product development cycle shortening as it becomes easier to get from concept to production.